Eeeek, I'm a little scared to start my blog. Don't want to mess it up before it's even begun. I think I'll start off with a simple 10 things about me. 1. I have a very busy year ahead of me: my last year at uni, wedding plans and learning to drive. 2. I LOVE food; cooking it, eating it, reading about it, staring about it. 3. I used to be a very fussy eater but from reading and trying out recipes myself I've introduced a lot of new things to my diet. Yum. 4. I jog, not very far and not very fast, 2-3 times a week. I started this up in March to try to get in shape for the wedding. Not making much progress at the moment but I'll keep it up...or try to. 5. I like animals and animals like me. I currently have 3 cats and a hamster (her 3 sisters recently passed on) and have had some beautiful rats in the past. I have a big thing for birds of prey and have so far managed to work them into every big project I've done at university. 6. I used to paint a lot. I did art at a levels and then went on to do a Foundation Degree in art at university. I started that year expecting to go on to a Fine Art degree, but alas, it was not for me. I seem to have no time to draw much or paint these days, but I still doodle and take photos whenever possible. I'm also quite crafty and enjoy making cards for any occasion. I would love to do more. 7. I am a movie addict. I tend to go to the cinema 2-5 times a week, depending on how many films are out and whether I have the fare for the train to the nearest cinema. Sadly my local cinema shut down 2 years ago due to the 99 year lease running out. I will see any film as long as it isn't a war film (with a few exceptions such as Downfall), extra points if it has subtitles, was touched by Judd Apatow of Kevin Smith or has a good looking protagonist. Me, shallow? My favourite films of all time are the Lord of the Rings trilogy, In Bruges, Knocked Up, Braveheart, 300, Amelie and anything by the above directors. 8. Music: the more obscure the better. 9. I like all things to do with Ancient Egypt. My hamsters, when all 4 of them were with us, were called Nepthys, Sekhmet, Isis and Tefnut after female Egyptian deities. 10. My favourite thing to cook is risotto, either asparagus or squash. YUM! I have to cook double the needed amount because the fiancé, J, loves it so much. 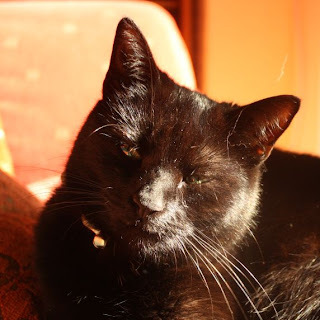 To end with, a photo of my cat Ebony, taken today. I am adding another as it somehow slipped my mind earlier. 11. I am a night owl. I truly come alive at about 8pm and that slightly more energetic me lasts until about 2 or 3 am. It is not very practical and doesn't make for happy mornings but it's the way I've been since the age of 7. It takes me a very long time to get to sleep, so although I love sleeping, I don't do enough of it, and definitely not at the appropriate times.